Carl Sagan was a brilliant astronomer who also had the enviable talent of being exceptionally good at communicating what he loved to other human beings. For specialists in any field, this skill is in relatively short supply. This talent (or ability, perhaps) is what made Sagan so recognizable and effective outside his own specialized field of all things astro. It is a supreme challenge for the popularizer of science to make clear the actual, tortuous history of its great discoveries and the misapprehensions and occasional stubborn refusal by its practitioners to change course…It is enormously easier to present in an appealing way the wisdom distilled from centuries of patient and collective interrogation of Nature than to detail the messy distillation apparatus. The method of science, as stodgy and grumpy as it may seem, is far more important than the findings of science. Sagan wishes us to understand that science is certainly laborious, but that it is also worth the labor. The many unexpected joys of experimentation and discovery are hinted at in that first chapter and repeated on every page throughout. While Sagan delights in the ultimate findings of science, in this book he is more interested in convincing readers (non-scientists) how wonderful the methods are. 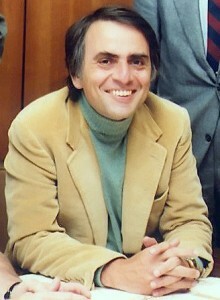 Other pieces of Sagan’s skeptical approach include methodical distrust of conclusions, ongoing testing of hypotheses, the never-ending search for more data (he calls it curiosity), and an enthusiasm for complicating (or challenging) the known data set in favor of more/better data. What makes this book a “love letter” rather than simply a treatise on science is Sagan’s complete lack of fear. He is not afraid the world will fall apart if no one listens – in fact Sagan seems to be supremely confident that a “scientific” basis for experiencing and learning is self-evidently superior to all other approaches. Ethics, he admits, are ambiguous at best in Science. But, he argues, what good are ethics if they are based on faulty or incomplete information? Sagan’s Demon-Haunted World was an interesting read. It had the rare distinction of seeming both pleasant and dense at the same time. This is a book that bears multiple reads and encourages me to find other works from Sagan as a comparison. I wonder whether all his works have such a clear agenda, or if this is anomalous compared to his general body of work. Based on my handy dandy 5-star rating system, The Demon-Haunted World gets a solid four stars, with the potential for an upgrade sometime in the future (after a re-read or two) because it was interesting, challenging, begs for a re-read, and encourages me to read more by this author.